Wayfair offers a zillion things home – the largest selection of home furnishings and décor across all styles and price points. For more information and inspiration, visit Wayfair and follow Wayfair on Facebook, Twitter & Pinterest. Wayfair compensated me for this post but all opinions and project ideas are mine. Welcome to week #2 of Endless Summer Projects! I'm delighted to team up again this week with my blogger pals: Ali, Melissa, Jen, and Amy. We taking our project to the big leagues this week with a large two foot by three foot canvas. Grab your favorite tapes and some scissors and let's get to work. 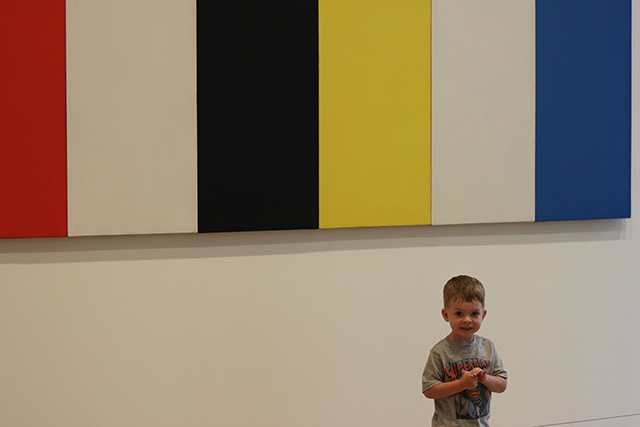 When my little guy L was an even littler guy, we took he and his sisters to the Art Institute of Chicago. They ate up all the painting and sculptures, but the wing of modern art was a favorite. At 2, L fell in love with this giant striped piece and ever since then I've been thinking about how to bring this idea to his space. With all of the awesome washi tape and duct tape varieties now available, this striped project got a whole lot easier. The supply list is simple: a large canvas (the large scale can better handle the wide variation in pattern), tapes, and scissors as well as your favorite stripe lover. L is just a little bit bigger than this canvas, which was a fun way to note his relative age/size as we were creating this together. We decided together that we wanted vertical stripes, and we began off center so that we could create a non-symmetrical striped pattern. You can predetermine the order of your stripes or do what we did and create balance as you go by making some of the stripes extra thick and others thinner. 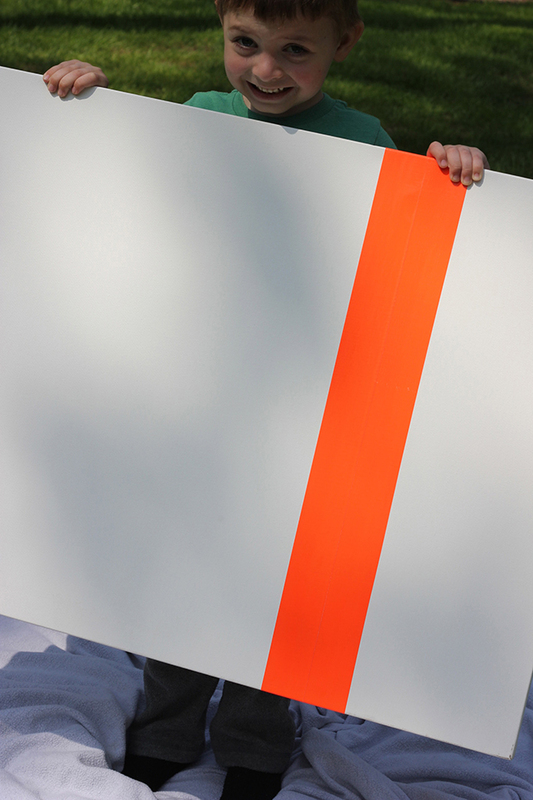 Secure each stripe by extending the line to the back of the canvas. Perhaps the most challenging part of this DIY (though none of the steps would really be considered challenging) is making sure that your lines stay straight as you pull the tape down the canvas. 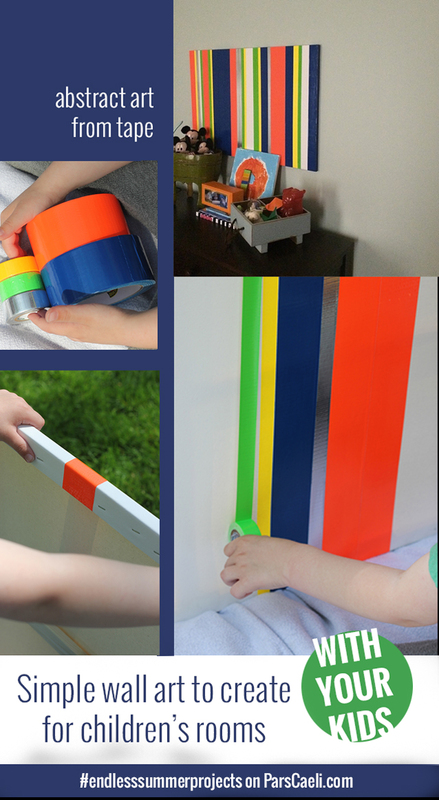 Little hands can easily select what colored stripe comes along next and guide the roll of tape as you straighten and trim the ends. Let's just say this project had us at hello, and L was so excited with his new canvas, even if it had one lone stripe. But we kept moving forward, mixing up the width of tapes as we added new colors to the canvas. We had five different colors and a windy day, but all in all this project took us 30 minutes from start to complete in his room. L and I worked together to hang our new artwork above his dresser. It already houses some Wayfair pieces! And I've been looking at these three as other fun additions to this big boy room (a fire extinguisher water hose is the best)! 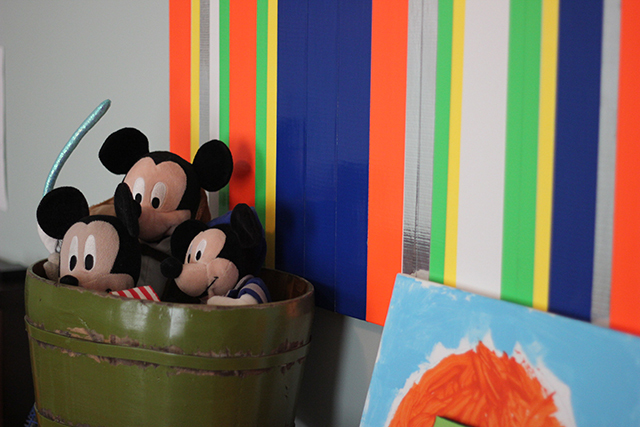 The finished art offsets L's very special items and pops all the bright colors in the room in a fun and festive way. L pulled out a classic quote on me while we were making this, "Mommy, whenever I look at this, I'll think of you and all the fun we had making this!" Awh. So sweet. How could I not give this kid something special?! My blogger gals and I are hopping around today to show off our favorite picks from Wayfair for children's and tween's bedroom and playspace. Click on over and see the adorable ice cream supplies with Alexandra, the colorful picks at Lulu the Baker, the chic art prints at Classic Play, and all the animal love you could want at This Heart of Mine! If you missed it last week, be sure to grab Jen's printable summer banner for end of the academic year celebrations that kicked off our Endless Summer Projects series. Thank you all for visiting and sharing and enjoying time spent with your kids in the creation process!